In the eCommerce market saturated with a plethora of shopping carts, it becomes exceptionally complicated to select platform for perfectly addressing business needs. Each solution is fighting to rein, and this has contributed to confusion engulfing the company strategies of many merchants. Since number of solutions are constantly increasing, it is suggested to investigate comparative study on the suitable software. Among a wide array of beneficial shopping carts, let’s place the focus on the Zen Cart vs OpenCart comparison. If you can’t choose between the two, keep reading our unbiased analyzes. Every eCommerce solution comes with its own advantages and disadvantages. To explore the right business fit, you should access your company needs first. So, which shopping cart between Zen Cart and OpenCart aligns with your requirements? Both platforms are well-designed solutions that help organizations to enhance sales and boost company performance. Zen Cart is a better choice to satisfy the small and medium businesses demands. OpenCart caters the mid-sized and large online stores. The above-mentioned platforms include differences in some primary features. Zen Cart is a suitable platform for tech-savvy users. It offers increased flexibility and simplified installation that provides with a possibility to easily handle multiple product capabilities. Among the most popular ones are drag and drop design, dedicated IP address, optimized URLs, breadcrumb navigation, etc. The solution contains the efficient marketing tools: email list management, affiliate program support, newsletter, gift cards, and coupons. Even though Zen Cart offers you practical functionality, the solution supports only English language and lacks innovative extensions. Some of available applications are complicated, it can take time to introduce and upgrade. OpenCart provides you with all basic capabilities required to run successful e-shop. It offers an extensive variety of customizations to satisfy your preferences and company requirements. In terms of functionality, solution takes the upper hand over Zen Cart. Your online store can benefit from the bulk image support, unlimited products & categories, multistore support, digital goods, daily backup and others. It enables you with built-in OpenCart SEO to improve traffic rates. The platform comprises loads of the comprehensive modules and add-ons to help you expand e-store functionality. One of the main differences included in Zen Cart vs OpenCart rivalry is themes availability. The first solution lacks visually appealing and professional templates. However, you can customize them in accordance with your e-shop needs. You get an opportunity to download free templates provided by ZenCart community. Check out more detailed information here. OpenCart themes are powered by the applications: Envato, ThemeForest, TemplateMonster, Colorlib, etc. You can download templates from OpenCart Extension Store and get responsive themes with an ability to customize them. You will be able to edit code to satisfy company requirements as the platform is open source. It is well-known that security regulations are paramount for every online shop. When the e-store obtains convincing security measures, you can easily win trust of the potential and existing clients. Zen Cart is not completely rigid since it only includes daily backup, FTP access, and PCI compliance. In terms of security, OpenCart provides you with more possibilities to encourage the customers to perform the transactions without fear of losing any personal data. In addition to Zen Cart’s features, the solution guarantees to treat information privately with the help of FTP access database caching and data encryption. You can benefit from different SSL certificates to ensure the prospects with efficient security compliance. OpenCart includes a proper access authority that lets you protect the solution and administration panel with passwords. Zen Cart’s set is limited to discount management and multicurrency. However, the platform includes next payment gateways: LinkPoint API, YourPay API, Skrill, C.O.D., Check/MoneyOrder, etc. Also, the additional ones are available in Plugins and AddOns Directory. OpenCart stands out for the richer list of features: cash on demand payments, live shipping quotes, money orders, discount management, multicurrency, and pricing per customer group. Furthermore, you can benefit from the 36 inbuilt payment methods such as Authorize.Net, First Data, Klarna, PayPal, etc. In the eCommerce industry, shipping options are essential aspects of your online store. The broader variety of shipping modules to choose from, the better. Zen Cart enables you with limited shipping abilities: international postage fee and FedEx price lookups. On the other hand, the solution allows to add your own choices and integrate with the major international carriers. You can take advantage of the shipping estimator designed to give the clients the shipping cost before they check out. OpenCart includes the shipping options that are integrated with shipping prices, USPS price lookup, weight calculator, and tax by state/country. The platform supports drop, Flat rate, weight-based shipping, and product-specific tax rules. Over and above, Opencart integrates with the world-renowned postage modes comprising the Australian Post, Citylink, Royal Mail, Parcelforce, FedEx, and more. It is not a secret that efficient customer service is a path to your business growth. Zen Cart support is represented by team of developers who have invested in the software. You can get assistance via forums, user manual, facebook, Zen Cart Wiki, tutorials, and FAQs. OpenCart takes the lead here: it obtains phone, email, knowledge base, blogs, videos, online self-serve, request form in addition to what Zen Cart has to offer. Both platforms are open-source eCommerce solutions. Zen Cart and OpenCart offer incredible flexibility and let you add capabilities not included in default versions or customize existing features. Concerning the pricing, the shopping carts require no cost to download, update and use. Yet, Zen Cart obtains a slight edge over OpenCart because it is entirely free and includes GPL2 license. To be more specific, you can upgrade the software without any extra spendings. Even though the solutions are free, you are responsible for their hosting and security. So, it is suggested to save a buck for domain name, SSL certificate, web hosting fee, paid add-ons, etc. 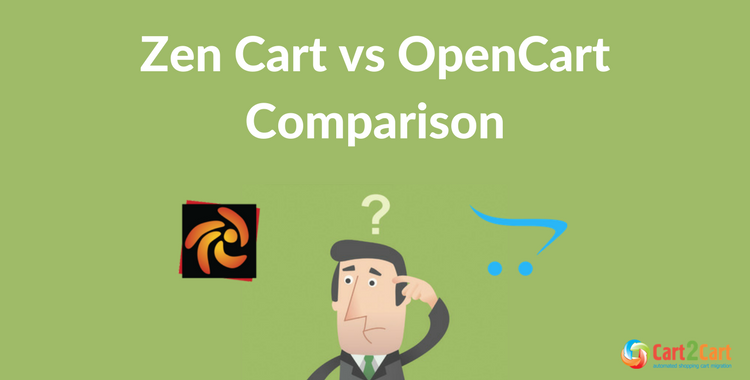 As it follows, the Zen Cart vs OpenCart comparison shows that each solution has its pros and cons. Your choice only depends on the business requirements and goals. Zen Cart can help manage an online shop in the English speaking regions and falls short in some functionality options. OpenCart, on the other hand, is your inevitable choice when you are not tech savvy and want software to run the e-store easily. The solution includes efficient features and tools to help your organization prosper, offers great customer service and support assistance. So, if you are interested and want to perform e-Commerce data switch to another shopping cart, consider transferring the entities automatically. Take advantage of Cart2Cart automated migration service to launch the Zen Cart to OpenCart import fast and securely. The SaaS helps to move information without downtime of your current solution and offers 24/7 support assistance. Have some hesitations? It is time to make changes, start your Demo Migration right now!